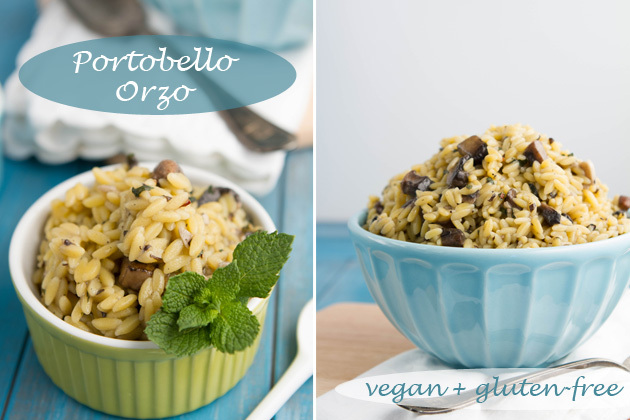 Oh man, orzo is awesome. It’s pasta, but small like rice which means that you can eat more of it with each spoonful than say, when you eat spaghetti. Paired with a nice and creamy (vegan) sauce and you have a meal that even your picky boyfriend will eat. Yes, I said it… Kevin enjoyed this vegan and gluten-free entree. And what’s more? He didn’t ask me where the meat was afterward. Kevin always asks me where the meat is. Heck, I’m sure he’d have sausages with his oatmeal if he could. No sausages in oatmeal at this house. 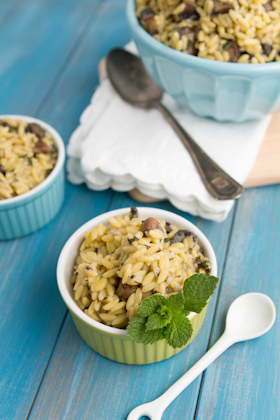 I have no doubt that one of the main reasons this recipe was so good is because of the quality of the orzo. It held together nicely in the pot as it boiled, combined really well with the sauce, and wasn’t all hard and nasty the next day. I’ll continue to say it – DeLallo gluten-free pasta is the best gluten-free pasta I’ve tried, hands down. If you see it at the store I urge you to pick up a bag, give it a whirl, and let me know how you like it. This would be a great recipe for Thanksgiving, or a meal for a cool and blustery Sunday night while you try to stay all snuggly bum warm in the house. 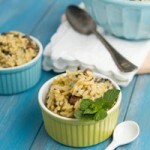 A comforting vegan dinner for a cold and blustery evening. 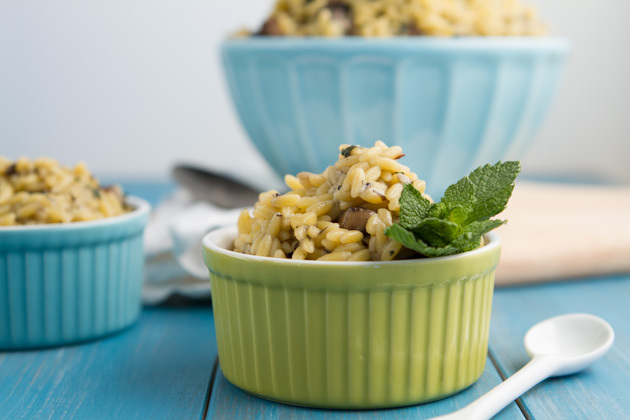 This gluten-free orzo is smothered in a dairy-free lemon mint cream sauce and warming with every bite. 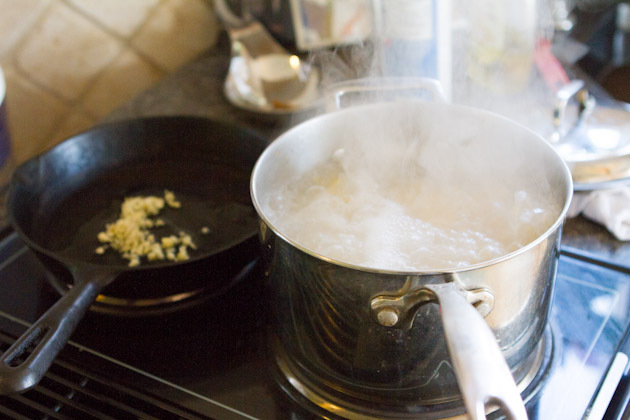 Bring a large saucepan of salted water to a boil over high heat. Add the orzo and cook until tender but still firm, about 11 minutes. Drain. Meanwhile, add olive oil to a skillet over medium-high heat. Add garlic to pan and saute for 1 minute. Add chopped portobello and cook until tender, about 6-7 minutes. Combine broth and arrowroot starch in a small bowl; stir until well blended. Add broth mixture to pan; bring to a boil. Cook 1 minute or until thick, stirring constantly. Add milk, lemon juice, salt, and red pepper flakes. Continue to stir until warmed. Remove from heat. 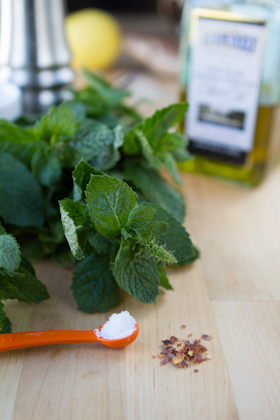 Stir in mint and black pepper. Add pasta mixture to broth mixture; toss gently to coat. Serve immediately. This is orzo cooking in my ridiculously small kitchen. Once I figure out how to make this small kitchen work for me, I will be blogging about it. For now, I’ll just say that it takes the patience of a saint to be a food blogger in a kitchen with 2 burners, 1/2 foot of counter space and a highly inaccurate oven. This experience will transform me into a better person, I’m sure of it. 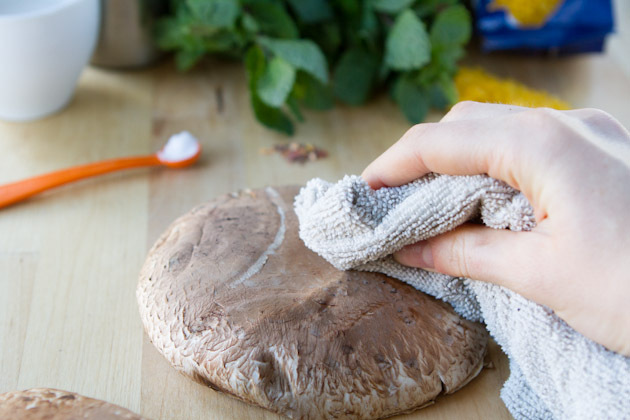 The best way to clean mushrooms is with a damp cloth. Yep, my Mom taught me how to do this! It helps to avoid the excess water that will go into your dish if you rinse your mushrooms. Just take a damp cloth and clean the top of the mushroom real good. You want to saute the garlic and mushrooms until they’re soft and a darn color. Combine the arrowroot and broth together to form a paste, then add it to the mushrooms. Continue to stir so that it doesn’t turn into gel on you! Once all is said and done, you just mix everything together and serve! I didn’t feel like the dish needed anything else, but if you want extra protein you could add a couple of cooked black beans or perhaps a couple of tablespoons of sesame seeds! 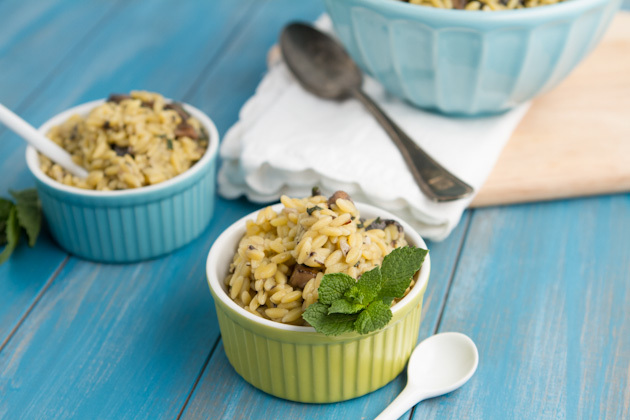 I shared this recipe with the DeLallo Foods team earlier this week along with a couple of tips which common products may have gluten hiding in them. You can find the article here. Kevin gets back from Calgary tonight and I couldn’t be more happier to finally see him. He and I have been traveling for work for the past month. When I’m here, he isn’t and vice versa. The longest I’ve seen him is 12 hours in the last 4 weeks. Crazy. We’ll be taking it easy this weekend, maybe heading to a new Indian restaurant on Saturday night to celebrate our 4 year anniversary (which was a week ago but he wasn’t here). Better late than never, right?